"Sinners shall find in My Heart the source of infinite mercy." When you are seeking forgiveness, there is a need for both honesty and true sorrow. If you are deeply troubled by your sins, Jesus wants you to come back to Him with all your heart. To despair of Christ's love would be a much greater sin. You may wonder whether Jesus has forgiven you for something you have done or failed to do. This is especially true when a person’s actions or inactions cause unexpected tragic consequences. Guilt can cause terrible mental suffering and can even destroy a person’s life. You will miss many blessings when Jesus is not fully present in your life. If you have committed a serious sin, go to confession as soon as possible... strive to stay in the state of Sanctifying Grace. 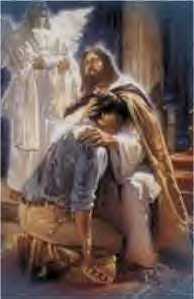 If you have guilt in your heart... then go to Jesus and let Him wipe it away. Jesus will forgive any sin, if the person is sorry and will try to avoid sin. Jesus, I come to you in faith. so that I could be forgiven. I ask to have a new life with God. Since God alone can forgive sin, Christ acts through the priest. There is no sin so great or so terrible that Jesus won't forgive. Priests receive from Christ the power to forgive sins in His name (Matthew 16:18-20 and John 20:21-24). The priest is bound by a most serious obligation not to tell anyone what was said in the confessional. Every Catholic--including the pope, cardinals, bishops, priests, sisters, brothers and lay persons--is required by church law to go to Confession at least once a year. It is a sin not to go. Our loving God is always ready to forgive and forget our sins.